The bike will be available in two variants - standard and dual tone - and is priced at Rs 1.08 and Rs 1.10 lakhs respectively (Ex-showroom, Delhi). Buyers can choose from four color options, viz. Blazing red, panther black, spotlight white, and vibrant orange. Popular motorcycle and scooter manufacturer, Hero Motocorp, has re-lunched the Hero Karizma ZMR in Indian markets. The bike will be available in two variants - standard and dual tone - and is priced at Rs 1.08 and Rs 1.10 lakhs respectively (Ex-showroom, Delhi). Buyers can choose from four color options, viz. Blazing red, panther black, spotlight white, and vibrant orange. First introduced in 2003, Karizma was touted to be India's first premium motorcycle. Back then, Hero Motocorp was Hero Honda, a collaboration between Japanese automaker Honda Motor Company, Ltd., and Ludhiana based manufacturer of bicycles and bicycle-related products, Hero Cycles Limited. In December 2010, however, the collaboration terminated upon the decision of the Board of Directors of the Hero Honda Group. Since 2003, Karizma received minor cosmetic upgrades. In 2007, the bike was re-marketed as the Karizma R. In September 2009, it was supplemented by another variant the Karizma ZMR. There is no difference between its engine and that of its predecessor. The minor differences lie in the design of headlight and the addition of a digital speedometer, rear disc brake, rear swing-arm suspension, and replacement of fuel-injection system instead of the carburetor. The incumbent model was launched in 2014, and had a totally new design along with an upgraded engine. The Karizma ZMR failed to meet the Bharat Stage-IV norms last year. The emission standards are instituted by the Government of India to regulate the output of air pollutants from internal and spark-ignition engines. As a consequence, the bike was pulled off the shelf. Now, the Karizma ZMR has finally received its BS-IV update and is ready to hit the roads. The present model was first showcased in February at the 2018 Auto Expo held at Greater Noida, India. It is powered by the same 223 cc single-cylinder, oil-cooled engine with fuel injection that is now BS-IV compliant, and produces 20 bhp at 8000 rpm and 19.7 Nm of peak torque at 6500 rpm. The motor is paired with a 5-speed gearbox. 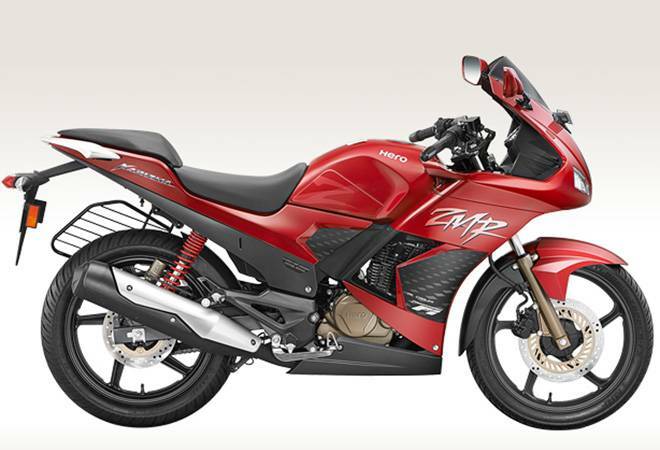 Hero claims a top speed of 129 kmph on the Karizma ZMR. Some may find the re-launch of Karizma ZMR surprising. Hero was thought to have moved away to newer premium motorcycles like the Hero Xtreme 200R and the upcoming Hero XPulse 200. Nonetheless, among other bikes, the Karizma ZMR is set to clash with the Pulsar RS200; Pulsar being one of its closest rivals in terms of performance, popularity, and sales.